YES! Amazon US sells “Sabaku no Harem”! If you love “Sabaku no Harem”, please give Mitsuru Yumeki your love and money by purchasing the series. I want to get this out to everyone in the hope of preventing unnecessary Tweets and emails. “Sabaku no Harem” is now on hiatus. It will return in late July in Lala Magazine. Yes! “Sabaku no Harem” will become a monthly series in July. So please be patient and keep in mind that what doesn’t exist cannot be released. This is the end of the pirate arc. I enjoyed this arc a lot and I look forward to where the story will go from here. I want some chapters that cover Mishe’s life and Kallum’s friendship with Aleph before Mishe became part of Kallum’s harem. I also hope to see more of Morgiana and her pirate crew because lady pirates are cool! I won’t keep you away from the chapter any longer, so onto the release! 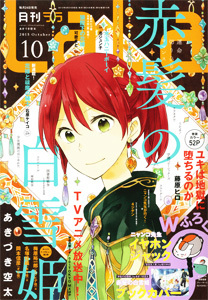 Next up will be “Kanojo ni Naru Hi Another” Chapter 15. What a great chapter.. And that kiss from the king is was great. Thank you so much for your hard work. Yep! Only 2-1/2 weeks until it debuts in Lala! According to the previews it’s going to be a 50-page chapter :3. I wonder will some things change now that it’s in Lala. The new chapter releases in Japan on the 24th. Since I import from Japan, I won’t get Lala until the 27th or 28th. Since it’s a 5o-page chapter, it’ll take the group around 2-week to scanlate. So expect our English release in mid-August. Mishe smiles this chapter were absolutely divine. OH HO! Welcome back! I’m glad you enjoyed it!